Here’s a fish that intrigues so many sea enthusiasts. The fish is very attractive, brilliantly colored, with highly ornamental fins. The chance to see the fish is an ultimate bucket list experience for divers especially underwater photographers. The mystery fish in question is none other than rhinopias. Rhinopias is a member of the scorpionfish family. They share many traits in common, including venomous spines. Unlike their cousins, however, rhinopias are very elusive. Not that they are endangered nor too small in size, but they are just that: a rare sight. That is why rhinopias is often called the “Holy Grail of fish.” The phrase makes us feel like entering the realms of underwater Da Vinci Code where we become Professor Langdon, trying to find the living treasure—rhinopias. We are not scientists for sure, but out of fun, we ever tried to “decipher” the species. We bet the name comes from the Latin word rhinoceros because its mouth resembles that of a rhinoceros, and pius which means devout because rhinopias looks like a pious person sitting still while praying. They prefer waiting for preys to hunting. This makes them easy to photograph and they make photogenic underwater models. But first, of course, you must find them! Fortunately, Alor archipelago is one of the only handful places in the world to spot the species, considering the fish only occurs within certain areas in the Pacific and Indian Oceans. 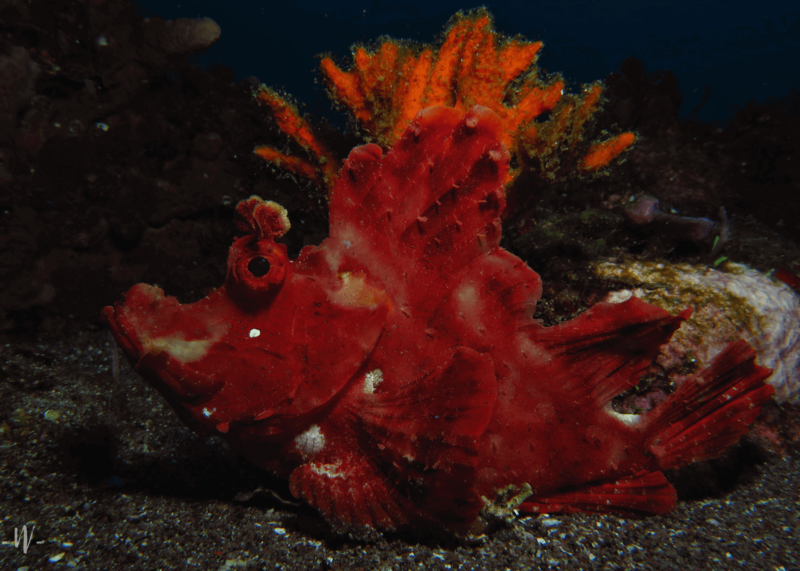 Rhinopias frondosa or the weedy scorpionfish and Rhinopias eschmeyeri or the paddle flap scorpionfish are two of the most common species found in Alor. 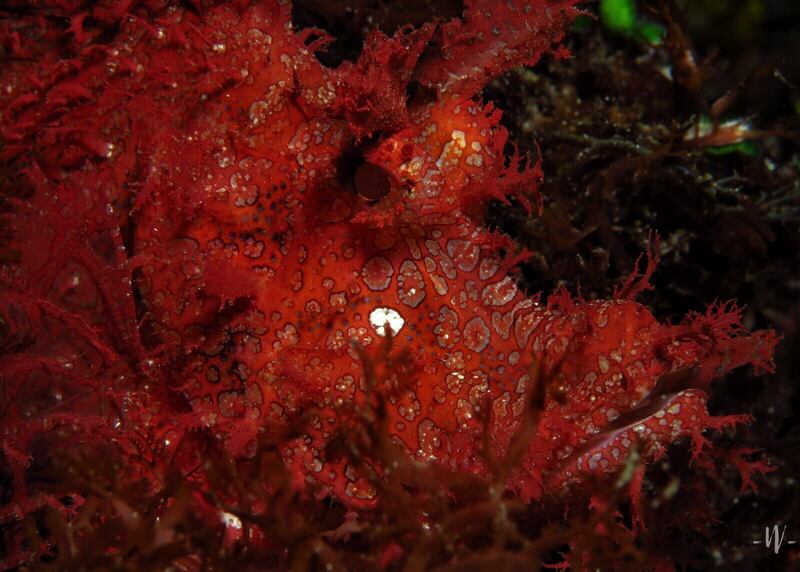 “Not long ago, we found four rhinopias in one dive spot: three frondosa and one eschmeyeri—each in different color. It’s our best record so far,” said Willy whose multiple photos of rhinopias grace our Instagram feed. So, which is which? To tell them apart, we have to “decode” them one by one. The name frondosa explains their weedy appearance. It is taken from the Latin word frondis which means leaves or fronds, like those of ferns or seaweed. This gives them benefit to camouflage with their surrounding. The fish range in colors, from yellow, red, white, to purple. The other is apparently named after the ichthyologist William Eschmeyer. 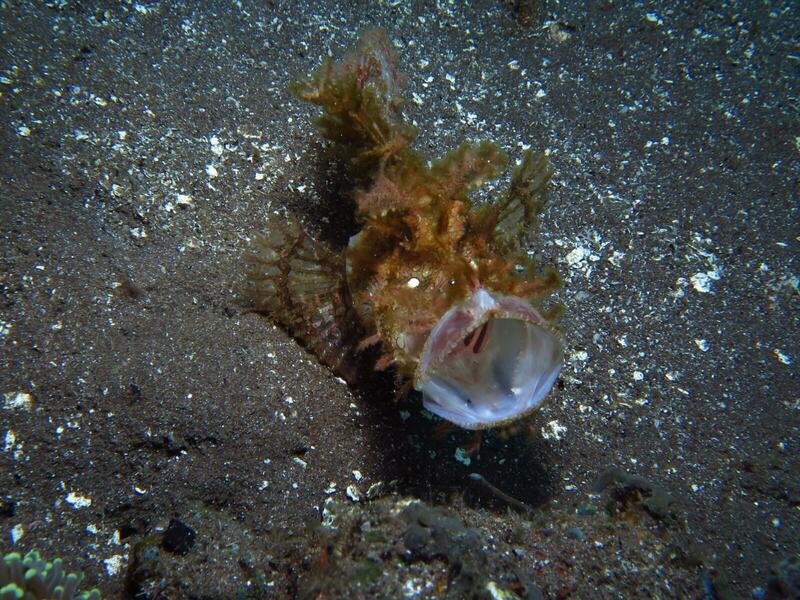 Usually the paddle flap scorpionfish is less “weedy” or “hairy” and has two tentacles on the lower jaw. They also master the art of deception, making them difficult to find, even when they are just sitting on the sand. 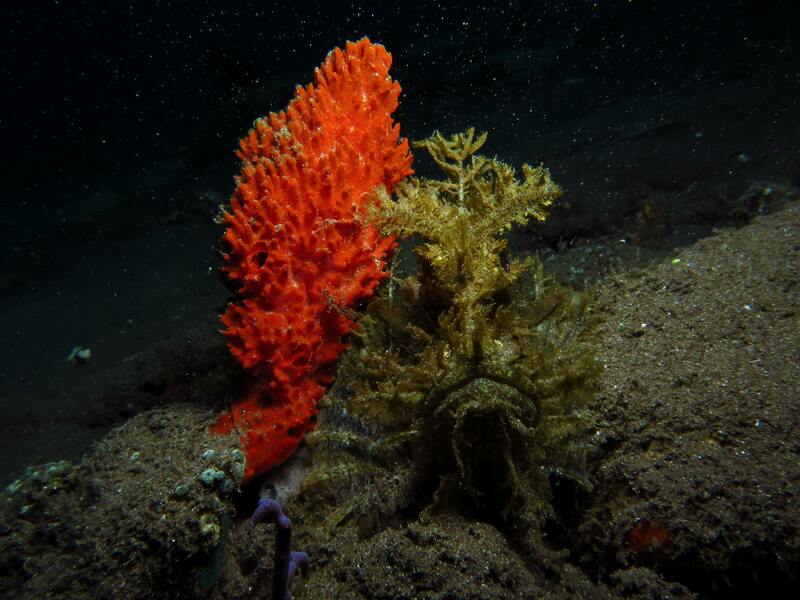 Our Specialty Diving in Alor: Dive with Rhinopias! Based on our experience, guests who did not know rhinopias would later say they were impressed by the fish’s unusual look. Those who knew it would most likely ask us to go back again to experience the thrilling encounter with rhinopias. The good news is we know where to spot them—thanks to their pious nature, they rarely move. We will take you to them. 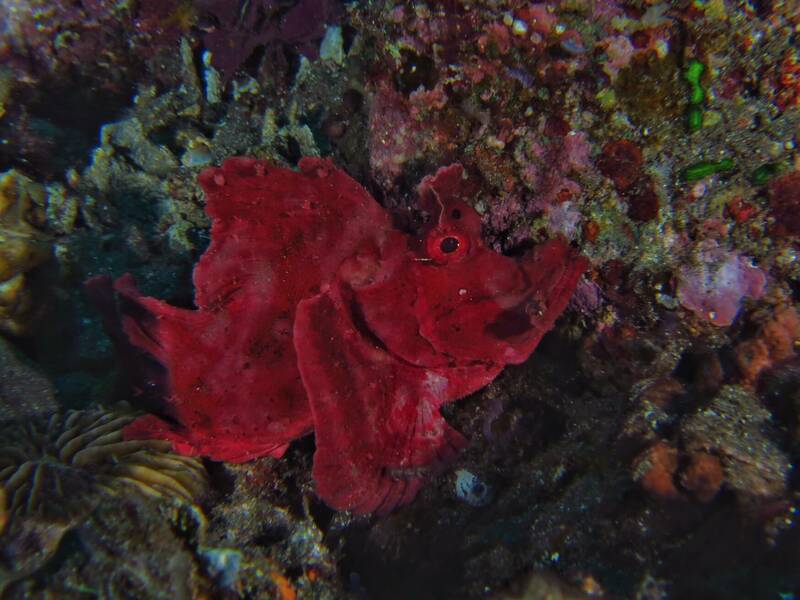 Even better, rhinopias can be seen during the whole diving season in Alor. So, come and dive with rhinopias with us!